You are here: Home / Deep Tissue Massage Therapy / Just What is sitting disease? Sitting down for more than 3 hours per day increases your risk of kidney disease, but more worryingly, it also increases the risk of type 2 diabetes, heart disease and certain forms of cancer and can cause fatty liver disease. 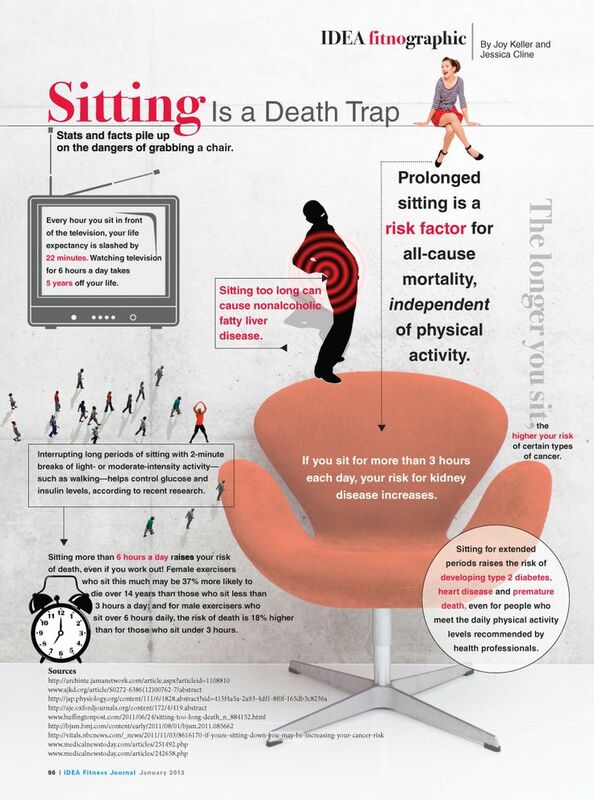 However despite all of these health warnings, many of us continue to sit down for long periods of the day. Indeed I have just seen a report that 4 in 10 British adults don’t even do one brisk 10-minute walk per month. It is clear that sitting down for long periods is more likely to lead to premature death in both men and women, with the risk being even higher for women, according to scientific studies. This is not very surprising because we are constantly being told this by doctors and health professionals. 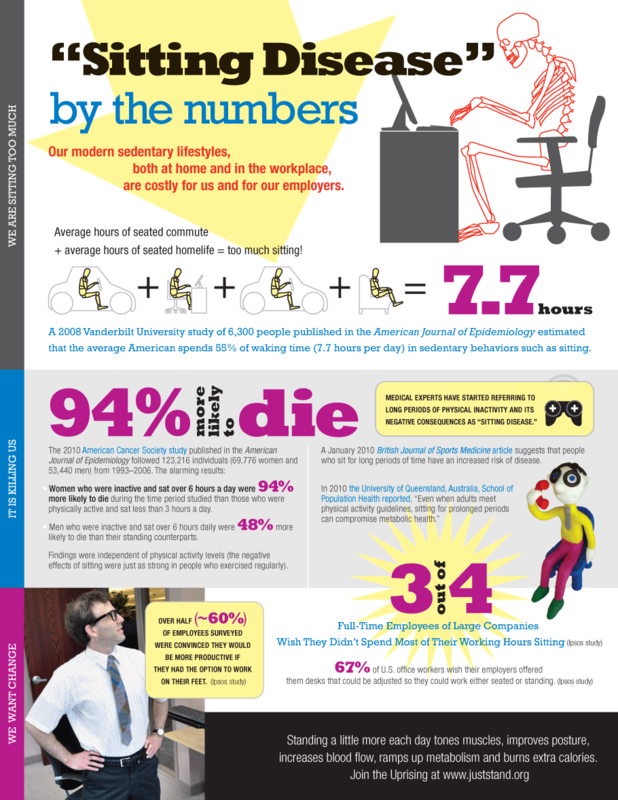 What is surprising, however, is that physical activity is not enough to completely eliminate the risks of sitting down for most of the day, according to this infographic. So if you do have an office job where you are sat in front of a computer screen all the time, you cannot negate the risks simply by going to the gym for an hour or two every evening. 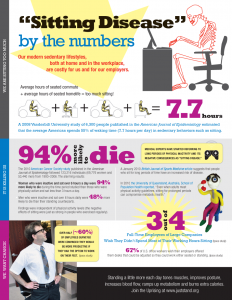 You need to actually get up and move around a lot more to reduce the health risks. Indeed I think this is the key point. If you do find yourself sitting down for most of the day, you should try to get up and walk around as much as possible. Taking regular breaks every 15 or 30 minutes is a good idea, and doing some form of cardiovascular exercise several days a week has to be better than doing none at all. It might also be an idea to ask your employer to switch to a standing desk, or to invest in an under desk cardio machine or an exercise bike, treadmill or elliptical trainer that doubles up as a workstation so that you can increase your activity level while you are working. The so-called ‘sitting disease’ appears to be a very real threat to our health, so you need to do everything you can to minimize the risks, and apart from anything else, standing up is actually good for us. As highlighted at the end of this infographic, “standing a little more each day tones muscles, improves posture, increases blood flow, ramps up metabolism and burns extra calories”. 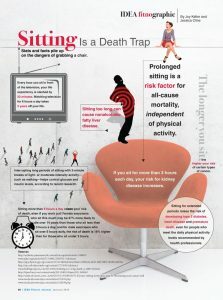 I myself am guilty of sitting down far too much, but the more of these health warnings that I hear, the more committed I am to doing something about it. So hopefully this article will help you to take action as well in order to reduce the long-term health effects of sitting down too much.